Battery testers are commonly used in garages and by people who use batteries a lot more frequently. These battery testers are compact, light in weight and tell the status of batteries by drawing heavy current from the battery while measuring its voltage level. The voltage level of a good battery remains relatively steady under load, but a defective battery will show a rapid loss in voltage. Battery size (CCA rating) and temperature also affect the test results. There is no shortage of battery testers but what the people need are accurate ones. The following article lists the best and the most reliable battery testers. Have a look and let us know which battery tester do you use. This battery tester has an expanded measurement range up to 100-1400 CCA(Cold Cranking Amps – standard for rating the battery). The Accurate battery test decision is shown within seconds and displays the available power in CCAs. The bad cell detection test can separate discharged batteries from others. The high/low voltage capturing voltmeter can check both starter and charge systems. It is extremely user-friendly and very easy to use. The Start-Voltage-Drop test function works well and is perfect for testing battery condition and can also test battery cables if attached to the engine block and a starting motor. 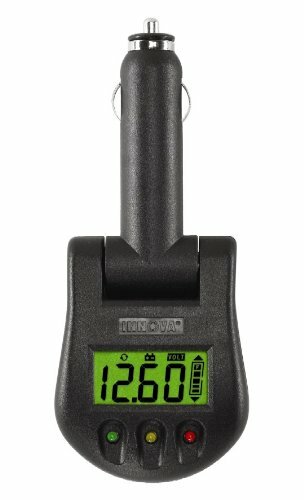 This is OTC’s 130-ampere digital battery load tester providing more accurate results. It has a compact and light design and is rugged for everyday testing of 6 to 12 Volts batteries. The unit has a large east to read display and comfortable ergonomic handle for a perfect grip. It has a width of 22 inches and can handle tire diameters of 24 inches to 36 inches. It is well-built and easier to use because of its digital scale and is very accurate. All tests are quite easy and the tester is made quite sturdy. The unit comes with an alternator test lead as well and a hanging hook for letting it cool/storage. The battery tester gets quite hot after using it a few times so the user needs to be careful. 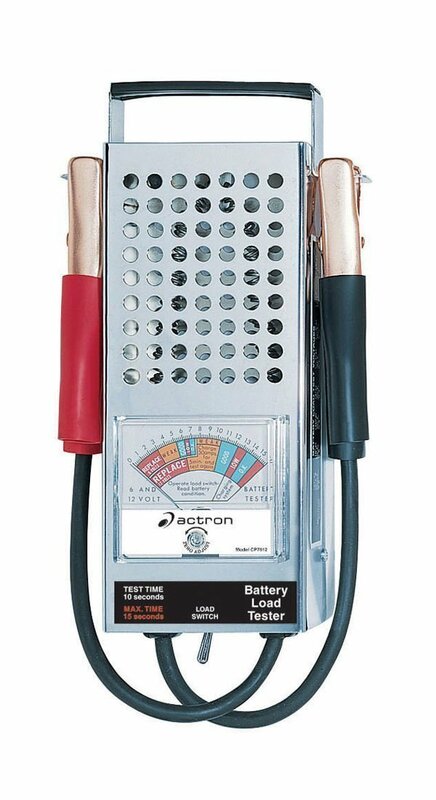 This is a chrome plated, steel housed Actron’s battery load tester. It has a rubber grip handle and side test clamp holders. It features a heavy duty momentary test switch. The leads come with strain relief, colour coded, insulated, and copper plated. 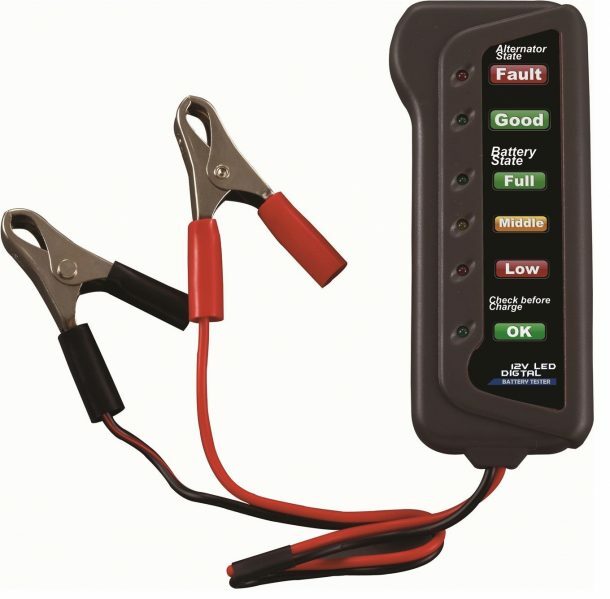 The battery loads tester accurately measures test conditions of battery and the charging system. It is extremely simple to use but can get hot if the spring-loaded test switch is held in the ON position for too long. “I have a solar system at my ranch property and making sure none of the batteries are dead is important. This product makes it quick and easy to do so. Also, it is made of metal, so if you drop it the unit is less likely to break. Great buy!” – Amazon’s Customer Review. This is Cartman’s 100-ampere battery tester. 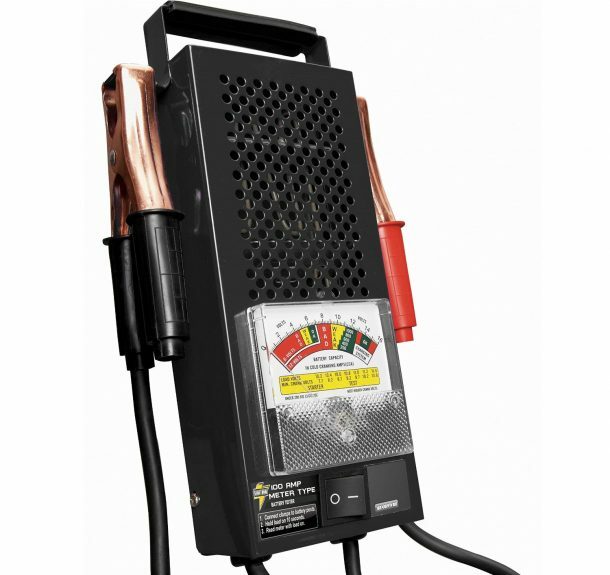 It can perform 100 amp load test for 12-volt batteries and 50 amp load test for 6-volt batteries. It can check battery condition and do a complete diagnosis of charging system. It comes with super grid battery clamps and a top-mounted rocker switch. It can show exactly much amount is left and is very simple to use. The unit comes with instructions. “The Cartman battery tester is very easy to use, and was greatly helpful in troubleshooting my battery problems. I highly recommend this battery tester for being lightweight and easy to use.” – Amazon’s Customer Review. 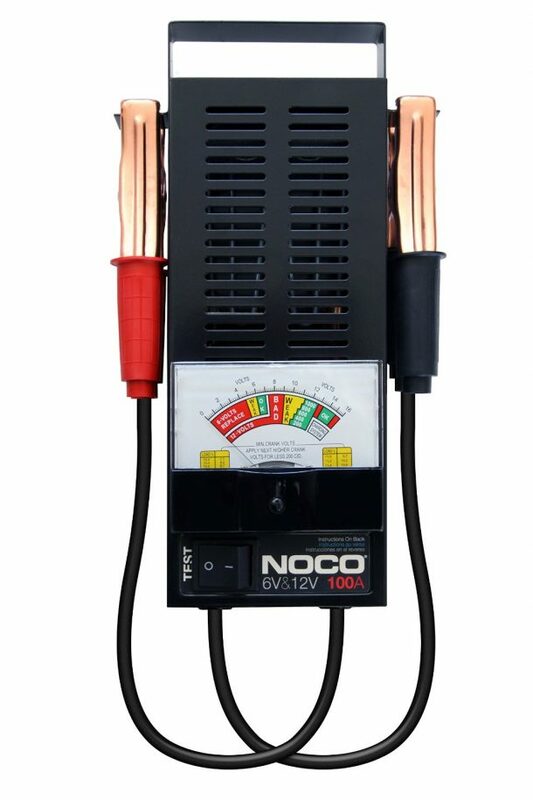 This is NOCO’s 100-ampere battery load tester that can quickly indicate good, weak and a bad battery. It gives the results within a short span of 20 seconds and has built-in capabilities for testing engine cranking ability , starter motor performance and charging system. This unit has been designed for both 6V and 12 V batteries and has a range of 1000 CCA. It is suitable for use with wet gel and is maintenance free. The clamps are nice and sturdy and instructions are easy to follow. The tester gets hot and might smokes initially(nothing to worry about). 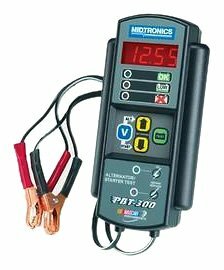 “The BTE181 load tester is a solid tool for checking your batteries. I use it on my riding lawn mower, car and boat. Does exactly what I thought it would do. Nice quality and a great price for a must-have tool.” – Amazon’s Customer Review. This is Cartman’s 12V car battery and alternator tester. The LED displays the condition (for a 12V battery only). It can also act as an alternator state check, battery state check, check before charge and overload display. The charger comes with quality clamps and works great as a portable tool. “Very easy to use, and takes only seconds to touch the two clips to the positive and negative battery terminals in order to get a reading. I use mine once a month so I get some advance notice when my battery is beginning to deteriorate. Would buy this item again. Well worth the price.” – Amazon’s Customer Review. This is Schumacher 1000 CCA, 100-ampere battery load tester for 12V batteries and 50-ampere load test for 6V batteries. The unit tests load and battery conditions and starter motor draw and diagnoses the complete charging system. 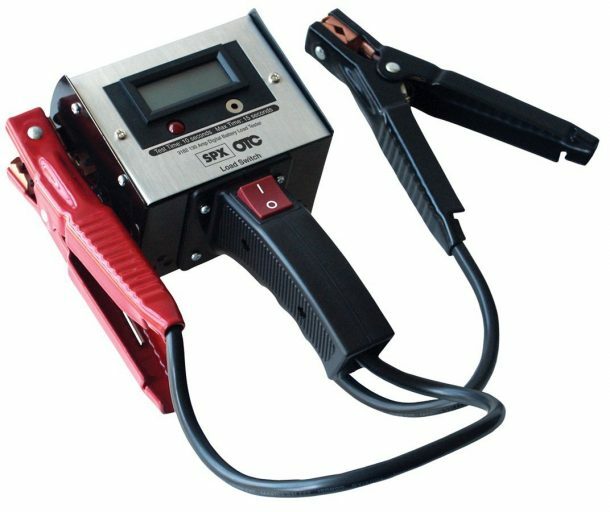 This device is a carbon pile load tester and does not test a discharged battery. “Works flawlessly from the first, and I use this unit daily in my lawnmower shop – it is a huge time-saver over “test by elimination” methods, and has successfully tested several dozen batteries and going strong.” – Amazon’s Customer Review. 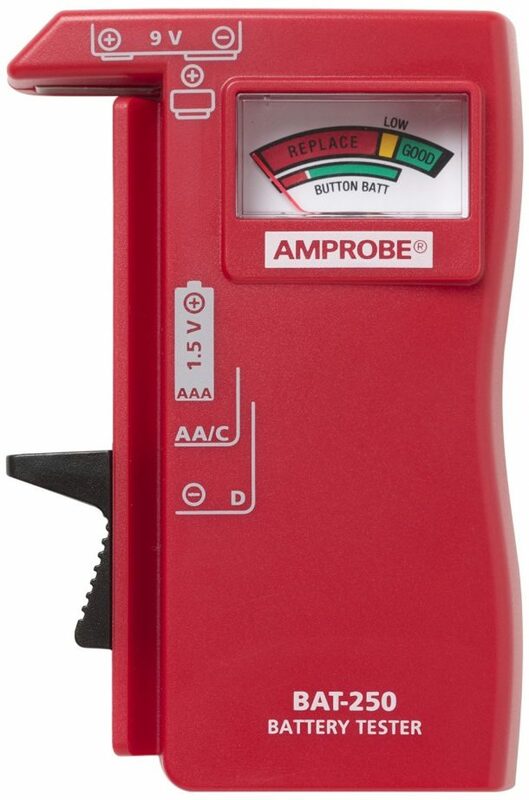 This is Amprobe’s battery tester featuring easy to read colour-coded display. This unit can test standard and rechargeable batteries: 9V, AA, AAA, C, D, 1.5V Button Type and does not require a battery to operate. “This will end up saving me about $35 or more per year. I run in the dark with a headlamp. The batteries have a meter on the side. The batteries will show very low yet this meter shows that they are good. I am getting an extra 6 hours more per battery.” – Amazon’s Customer Review. This is INNOVA’s battery and charging system monitor which easily plugs into vehicle’s cigarette lighter or power receptacle to monitor battery and charging system voltage. This unit is designed for 12V negative ground system and the LCD displays measured voltage with a bar graph to indicate the level of charging of the battery. The colour coded LEDs can quickly identify battery’s charging status and the head has a pivot for easy viewing and angle adjustment. The battery monitor shows the voltage value with 0.01 precision. Instructions are easy to understand and the unit is well made, sturdy and easy to connect. “Good value for money; very useful. From personal use, recommended.” – Amazon’s Customer Review. 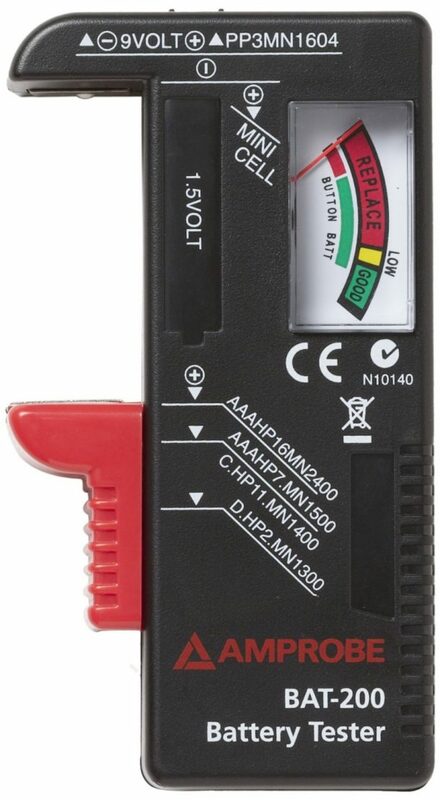 This is Amprobe’s easy to read, colour coded, battery tester. It can test standard, rechargeable batteries and household batteries (9V, AA, AAA, C, D, 1.5V Button Type). The unit has a compact design and does not require batteries to operate. Pretty simple but effective product and easy to use. “Very often batteries at near the end of their life will build up a surface charge that will trick a good quality high impedance volt meter into showing them to have more charge than they really do. This meter solves this problem by having a “working load” built in.” – Amazon’s Customer Review.